Making a Positive Connection with Your Client: Shut Up! “That’s why God gave us two ears and one mouth!” Any of us who has ever been on the receiving end of that missive knows that we have let our lips flap a bit too much. Though it can be aggravating to hear, the truth is that statement is gold. In fact, it is the cornerstone of an effective strategy for dealing fruitfully with your actual and potential clients. 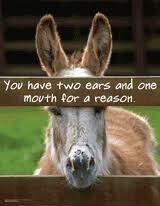 Whenever I meet with a current or potential client, I am very careful to let him/her do most of the talking. I listen CAREFULLY, and often take notes. When I do speak, it is mostly to ask questions based on what my client is telling me, and to reflect back to him/her the message I am being told. Not only does this inspire confidence in my client that I understand his/her business needs, but engaged listening is the only way to develop a satisfactory strategy to deliver what the client seeks. 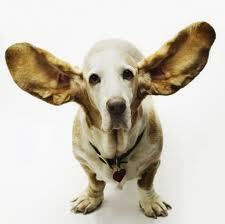 So the next time you meet with a client, actual or potential, remember that golden rule of listening. As the positive results build, it will bother you less and less to hear! This entry was posted in Social Media Management/Marketing by Jeanine Vecchiarelli. Bookmark the permalink.